Will you join us in Berlin from 7th to 9th March? And suddenly it's the end of February already. January came rushing by and we hope you have all had a great start into the quarter. 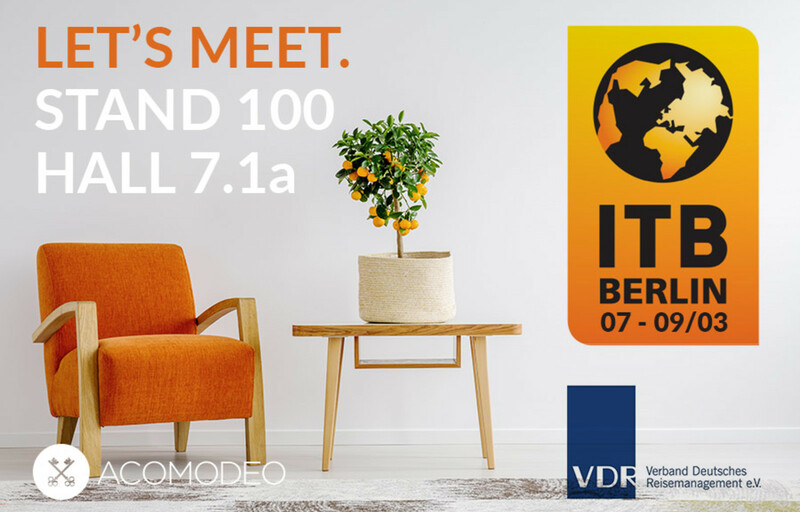 Not only have we been present at the Business Travel Show in London last week, but another exciting event is heading up: the ITB Berlin where we are happy to be exhibiting again. Will you join us? Please feel free to visit us in hall 7.1a in the HOBT pavillion (stand 100) from 7th to 9th March. If you'd like to book an appointment, please drop us an email to sales@acomodeo.com or click on the image below. In the meantime, "as Airbnb steps up its presence in the corporate travel space, Acomodeo is helping the established apartment providers to compete" as tnooz (2018) have put it. Word has it that a new generation of business travellers demand according new generation technology - do you agree? We'd love to hear your thoughts! Greetings from your Acomodeo team- don't hesitate to contact us!